FED UP with having to sleep in a tent during trips up country, Wayne Isbister was considering a caravan but was reluctant about having to tow around a full-size van. “On the Queen’s Birthday weekend when we were driving back from up country I saw a little Morris Minor towing a replica teardrop caravan,” he remembered. Wayne had always used tents overnight when travelling for his gigs as a singer at venues around Victorian and interstate. “It was always a hassle setting the tent up and packing up next day,” he said. Since then Wayne has built a scaled-down teardrop-shape camper reminiscent of the caravans of the 1940s and’ 50s. “The frame is made from 25mm square tube and the hardest part was bending the tube to the shape I wanted,” he said. Wayne said he spent three days searching the internet for plans and ideas before starting building the little van. “I sketched out the design I wanted after researching on the internet. Wayne used Colorbond steel as the outer-cladding and checker plate. “I built it from the outside in. I started with the interior plywood lining on first then the polystyrene insulation goes in and finally the outer skin of Colorbond sheet,” he said. “The polystyrene insulates the van and it doesn’t sound like a hollow piece of tin. It acts like a solid core door in a house. The teardrop caravan was introduced to Australia in the mid-1940s amid growing demand for lightweight caravans. In America they called them a cabin car. The earlier, teardrop-shaped caravans were built using a timber frame and a plywood outer skin. The teardrop became larger during the 1950s with inside kitchens and could sleep as many as five people. The 1950s version was heavier, still with a timber frame but the outer-cladding was polished aluminium used for aircraft production. When Wayne planned his caravan he wanted a better weight ratio on the drawbar. “Usually a normal trailer has a 60:40 ratio but I changed that so it has better balance. I can actually unhook it from a car and I can stand on the whole back end and jump up and down without it tipping up. Wayne said the idea was that the van could be towed at speed without twisting. Wayne has designed the van to fit a double bed or, when a side cupboard is removed, a queen-size mattress. “I looked at a couple of other designs where people have put the mattress in below the door but I made the doors bigger so people can get in. “I also did away with the bulkhead at the end of the bed. It felt like I was in a coffin when I slept in it. Wayne said he was planning to customise and hand-build a few vans each year. He has used Camec wind-out windows with screens and the back of the van has a lift-up section that reveals a camp kitchen. Wayne said older people became nostalgic when they saw the van, remembering camping holidays in the ‘40s and ‘50s. Wayne towed his van behind his Commodore Crewman ute on a recent trip up the Hume Highway, estimating he used just two per cent more fuel. “On the same trip it rained all weekend and I thought ‘At least we won’t get wet’. It’s much better than trying to pitch a tent in the rain and we weren’t sleeping on the ground. 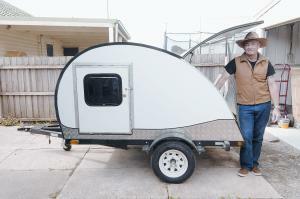 “It took me 162 hours to build the caravan and I was making jigs to make the next one easier. This entry was posted on September 10, 2010 at 5:43 am and is filed under Teardrop Trailer News. You can follow any responses to this entry through the RSS 2.0 feed. You can leave a response, or trackback from your own site.